All responsible dog owners do regular check-ups for their dog’s eyes, ears, and teeth. When checking their eyes, look out for redness, cloudiness, or tearing that might indicate problems like glaucoma, a scratched cornea, or dry eye. While cleaning out ears with a cotton ball or ear cleaner, inspect them for any smell, waxy build-up, or redness. Daily teeth brushing is deal, but healthy pups can manage with just three days a week. Scope out any broken or loose teeth or recessed gums. Trimming your dog’s nails is essential to their overall health. If left uncared for, nails can grow too long and begin to chip or break, causing your dog pain. Long nails can also cause arthritis due to the nails pushing toe bones into unnatural positions. Trimming also becomes more difficult the longer you wait between sessions and can cause the nails to bleed. To keep nails at a healthy length, it’s important to trim nails at least once or twice a month. Also remember that cutting dog’s nails too short can damage blood vessels and veins present at the base of their nails. Different dog breeds have different coats of fur, so make sure you’re using the right brush for their unique needs. My Pet Warehouse has a great article on the best brush for your dog to help you decide what grooming tool suits your needs. Brushing your dog regularly reduces shedding, prevents and removes matted hair, promotes bonding, and stimulates healthy oil production. Brushing is also a great opportunity to examine your pup’s skin and fur for any abnormalities like lumps or spots. 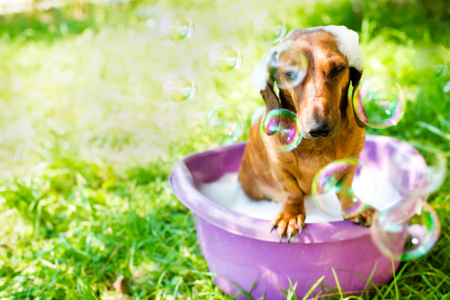 When it comes to giving your dogs a bath, beware of using any human products. Dog and human skin have different pH balances, which means human shampoo can dry out your dog’s skin and leave them vulnerable to parasites. To make things easier when washing your dog, you should always brush first to pick apart any mat-like coats of fur. This helps clean the overall coat. Rinse your dog thoroughly to prevent shampoo being left on the dog and make sure to blow dry to help prevent mats from coming back. Checking for these tiny little monsters can be a pain, but it’s absolutely necessary. These insects are so small that they are sometimes mistaken for dirt, but a thorough inspection should allow you to find them. It’s best to perform these checks frequently (especially after your dog spends a long time outdoors) to catch the problem early and avoid infestations. Be sure to also use a flea and tick prevention technique, whether it’s a collar, topic treatment, oral tablet, or spray, to help stop the problem before it starts. As we tell any child before they receive their first puppy, a dog is a big responsibility! Before adopting a dog, make sure you have the time and resources to commit to their basic care and health. Following these essential dog grooming practices will help ensure that your pup stays happy and healthy – don’t let them down! I appreciate what you said about trimming their nails at least once a month. I didn’t realize that this could end up causing them so much pain if ignored or that it could even make them bleed. I’ll be sure to get some help with trimming our dogs nails until I feel comfortable enough to do it on my own. These grooming tips should be followed by every dog owners. Thanks for sharing. Great explanation!!! Dogs are the best friends in my daily life. I maintain this routine to care about my dog. A dog is my family members to it is safety depends on me, I have performed following task for caring it. I have a somewhat large husky that has very thick fur that I have trouble keeping groomed myself, and I’m considering getting her a professional grooming service. It’s good to know that a grooming service works as a sort of health checkup, as well, and I’ll make sure to get a service that does the checks for illnesses and cleans out her ears, as you suggest. I’ll have to check out your article on choosing a brush, as well, though I’m sure the service will know what kind her coat needs. You got me when you said that your dog can experience pain if their nails chip or break due to lack of care. My husband and I have dogs who have never been groomed. There was a time when our dogs suddenly stopped playing due to broke nails. I don’t want to see them in pain, so I’ll find a pet groomer as soon as possible. We just opened up our mobile grooming salon. I know grooming may not be the most exciting thing you can write about, but you did a great job in keeping it fresh. You got me when you said that your dog can suffer in pain if their nails are going to be left uncared for because they can grow too long. With that in mind, I’ll make sure to bring my dog to a grooming professional soon. His nails actually bled last night when he tried to run to greet me. I saw how his nails hurt him.